Relaxing stays await at Sunway Resort Hotel & Spa, which features direct access to the Sunway Lagoon Theme Park and Mega Shopping Mall. It has free parking and an outdoor pool. 5-star rooms at Hotel Sunway Resort provide the comfort of a chaise lounge, carpeted floors and modern furnishings. They feature a flat-screen cable TV and a marble bathrooms with bathtub. Enjoy full workouts at the well-equipped fitness center. Alternatively, day trips can be organized at Sunway’s tour desk. Soothing treatments await at Mandara spa after a day of activity. Blends of Asian and Western cuisines are served at The Atrium Café & Lounge. Other dining options include Fuzion Café. Sunway Resort Hotel & Spa is a 45-minute drive from Kuala Lumpur International Airport. The Villas has direct access to Sunway Pyramid Shopping Mall and Sunway Lagoon Theme Park. It offers accommodations with private swimming pools and butler service. A full spa is featured. Luxury awaits in each villa, furnished with an outdoor rain shower and deep sunken bathtub. A tailor-made menu is available upon request. Guests can enjoy views of surrounding nature from their balconies. An outdoor pool and fitness center with cardio machines are provided at The Villas. Massages, facial and body treatments are available at Mandara Spa. Free parking is available. Live cooking stations and a fresh seafood bar are features of Fuzion Café. Asian dishes are served at the Atrium Café and Lounge. Other dining options include a Chinese restaurant and New Orleans Bar & Grill. The Villas is a 25 minute drive from central Kuala Lumpur, while Kuala Lumpur International Airport is 35 minutes away by car. Along with modern accommodations with a flat-screen TV and internet access, One World features an outdoor pool, a spa and 5 dining options. A cigar room and fitness center are available. In Petaling Jaya, One World Hotel is less than one mile from Bandar Utama 9-Hole Golf Course and a 35 minute drive from Kuala Lumpur International Airport. Spacious air-conditioned rooms at One World feature private bathrooms with a separate bathtub and shower. In addition to a minibar, room service is provided. Facilities at Hotel One World include a beauty/barber shop and a business center. Travel arrangements can be made at the tour desk. Guests can relax in the steam bath or play a game of tennis. Those who drive can enjoy free parking. Cantonese, Japanese and local dishes are served at the hotel’s 3 restaurants. Alternatively, a terrace allows for outdoor dining. The Sphere Lounge and Poolbar & Grill offer snacks and drinks. A 15-minute drive from Kuala Lumpur City, Eastin Hotel features 5 dining options and an outdoor pool. Offering a spa and a fitness center, it offers rooms with free Wi-Fi access. In Petaling Jaya, Hotel Eastin is 2.5 miles from Mid Valley Mega Mall and about 25 miles from Kuala Lumpur International Airport. Spacious and modern rooms at the hotel feature large windows. With air conditioning and a TV with satellite channels, they come with a minibar and a tea/coffee maker. Guests can play a game of tennis, sing in one of the karaoke rooms or relax in the sauna. A business center is available. The hotel provides a free city shuttle service upon request. Swez Brasserie Restaurant serves international and local specialties. Other dining options include Eyuzu Japanese Restaurant, Ee Chinese Restaurant, The Divan and the Lobby Lounge. Room service is available 24 hours a day. Hilton Petaling Jaya is in Kuala Lumpur, just a 15 minute drive from the bustling city center. In addition to an outdoor pool, the hotel has a spa and free on site parking. Decorated in warm tones with wood furnishing, rooms are bright and airy with their large windows. Each features a private marble bathroom, a cable TV and minibar. Hilton Petaling Jaya is a 45 minute drive from Kuala Lumpur International Airport. Nearby attractions include Sunway Lagoon Theme Park, Petronas Towers and Amcorp Mall. 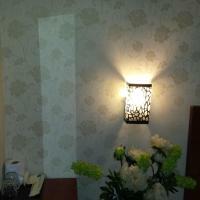 Beauty treatments and relaxation therapies are available at the spa and beauty salon. For a good workout, guests can use the well-equipped 24-hour fitness center. Other facilities include a business center and currency exchange services. Guests can have their pick of Chinese cuisine, Japanese fare or a wide buffet spread of local and international delights from the Hilton's 3 on-site restaurants. It also has a cafe and a fashionable bar and nightclub. Next to the Federal Highway, Hotel Armada Petaling Jaya is a 5-minute walk from Asia Jaya LRT Station. Featuring rooms with free Wi-Fi, the hotel has a gym, a bar and 2 restaurants. Contemporary guest rooms at Armada have a flat-screen TV with cable channels and a private bathroom with a hairdryer. Tea and coffee-making facilities and a minibar are included. Just 2.5 miles from Kuala Lumpur Golf and Country Club, Hotel Armada Petaling Jaya is about 25 miles from Kuala Lumpur International Airport. Guests can use the business center or play a game of pool. In-house guests can enjoy free parking. Local and Japanese delights are served at the hotel’s 2 restaurants. In-room dining is possible. Drinks, karaoke and live music are available at Wharf Dance Club. In Petaling Jaya, I-Hotel offers simple rooms with free Wi-Fi and 32-inch flat-screen TVs. Easily accessible from the highway and major shopping centers, the hotel provides free parking. The air conditioned rooms have private bathrooms with toiletries and a hot shower. Hairdryers are available upon request. The staff at the 24-hour front desk can provide concierge assistance. Food and beverages can also be ordered at the front desk. I-Hotel is a 5-minute walk from Giant Supermarket and several dining options. Shopping malls like One Utama, Tesco and The Curve are a 15-minute drive away. Sun Inns Lagoon is in Petaling Jaya, a 15-minute drive from Kuala Lumpur. It features a 24-hour front desk and rooms with a TV. Wi-Fi and parking are free. Sun Lagoon is a quarter mile from Sunway Pyramid Shopping Mall and half a mile from Sunway Lagoon Amusement Park. Kuala Lumpur International Airport is 24 miles from the hotel. All rooms at the hotel have warm lighting. Each room is equipped with a TV and has a private bathroom with hot shower facilities. Sun Inn provides baggage storage at the front desk. Sun Inns Mentari is in the entertainment area of Petaling Jaya, Selangor. A walk from the main attractions in Bandar Sunway, the hotel offers rooms with free Wi-Fi. Just 1700 ft from Sunway Lagoon Theme Park, the hotel is a 15-minute drive from Kuala Lumpur City and a 40-minute drive from Kuala Lumpur International Airport. Fitted with tiled floors, air conditioned rooms at Sun Inns are equipped with a satellite TV and an electric teakettle. Private bathrooms come with a hairdryer. Ironing facilities are available upon request. The hotel’s 24-hour front desk provides laundry and baggage storage services. Local eateries and fast food restaurants are within walking distance of the hotel. My Home Hotel Kota Damansara offers modern budget accommodations with flat-screen TVs and free Wi-Fi. Offering 24-hour reception, it is situated a 5-minute drive from numerous entertainment and shopping options. My Home Hotel is a 5-minute drive from the shopping malls of IKEA, 1Utama and Sunway Giza. It is 4 miles from the Sultan Abdul Aziz Shah Airport. Modern rooms at Kota Damansara My Home feature simple furnishings in neutral colors. Guests can enjoy the use of free Wi-Fi and flat-screen satellite TVs. Private bathrooms have hot shower facilities. The staff at the 24-hour front desk can attend to guest needs throughout the day. For convenience, daily newspapers and beverages are provided at Hotel My Home Kota Damansara. My Home Hotel is centrally located Petaling Jaya, a 15-minute drive from 1Utama Shopping Center. It offers free Wi-Fi in the entire hotel and air-conditioned rooms with private bathroom facilities. Rooms at My Home Hotel are simply furnished. They have a flat-screen cable TV and a phone. Bathrooms have both hot and cold water facilities. My Home Hotel SS2 features a 24-hour front desk. Newspapers and beverages are provided for guests’ convenience. 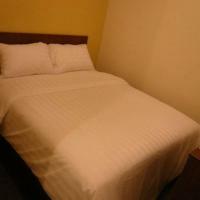 SS2 My Home Hotel is a short 15-minute drive from IKEA, Curve Shopping Mall and Sunway Giza. Sultan Abdul Aziz Shah is about 5 miles from the hotel. Located next to IOI Mall Shopping Center and IOI Mall Puchong, 101 Lake View Hotel offers accommodations with a flat-screen TV. It features a 24-hour front desk, free Wi-Fi and parking. Lake View Hotel is a 10-minute drive from Sunway Pyramid and a 20-minute drive from KLCC Shopping Center. Kuala Lumpur International Airport is a 25-minute drive from the hotel. Non-smoking guest rooms at Lake View 101 come with modern décor and hardwood floors. 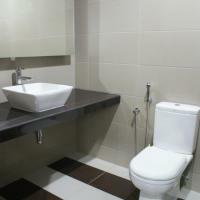 All rooms have a private bathroom equipped with shower facilities and toiletries. The hotel provides baggage storage and concierge services at the front desk. Room service is also available upon request. Sun Inns Hotel Kota Damansara is conveniently located at The Strand, a 20-minute drive from popular shopping malls like The Curve. It offers affordable accommodations and free Wi-Fi in the entire property. Kota Damansara Sun Inns is a 40-minute drive from vibrant Kuala Lumpur and Putrajaya City. Featuring tiled floors and decorated in neutral tones, rooms at the hotel offer all necessary comforts. They are air conditioned and come with satellite TV and private bathrooms. A hairdryer and ironing facilities are provided upon request. The hotel offers a 24-hour front desk and baggage storage facilities for added convenience. Casavilla Hotel is conveniently located a 10-minute drive from Kelana Jaya Putra Station. It provides well-priced accommodations with air conditioning and free Wi-Fi in the entire hotel. The Casavilla Hotel is a 45-minute drive from Kuala Lumpur International Airport and only 25 minutes from Subai Airport. Rooms are simply furnished, featuring a sitting area, a TV and ironing facilities. Rooms have private bathroom facilities. The guesthouse provides laundry and dry cleaning services. I Boutique Hotel is located in Petaling Jaya, about a 15 minute drive from Sunway Lagoon Theme Park. Rooms come with free Wi-Fi and a flat-screen TV. The hotel also has a 24-hour front desk. Fitted with hardwood floors, air conditioned rooms are equipped with a fridge, work desk and telephone. Interconnected rooms are available for families and group travelers. I Boutique Hotel is a 20-minute drive from Subang Airport and a 45-minute drive from Kuala Lumpur International Airport. Guests can park on-site for free. The hotel provides laundry and ironing services. Basic business facilities like fax and photocopying are also available. One Avenue Hotel offers modern accommodations, a 10-minute drive from Bandar Utama Town. It is surrounded by eateries and provides free parking and free Wi-Fi in the entire hotel. Hotel One Avenue is a 5-minute walk from shopping malls and a 30-minute drive from central Kuala Lumpur. The hotel is also 1 hour from the Kuala Lumpur International Airport. Rooms are air conditioned and come with a flat-screen TV, crisp white bed linens and a modern private bathroom. JJ Boutique Hotel (SS2) is in Petaling Jaya, a 10-minute drive from SS Two Shopping Mall. It features air-conditioned accommodations with a flat-screen TV. Free Wi-Fi is available. JJ (SS2) Boutique hotel is a 15-minute drive from One Utama Shopping Mall and The Curve. It is a 30-minute drive from central Kuala Lumpur and a 1-hour drive from Kuala Lumpur International Airport. Simply furnished, cozy rooms come with modern interiors. Each has an electric teakettle, work desk, and a private bathroom with shower facilities. Select rooms have a window. The staff at the front desk are available 24 hours. Newspapers are also provided. A 5-minute walk from Sunway Pyramid shopping mall and Sunway Lagoon Water Theme Park, Sunway Housestay has basic rooms. A non-smoking property, it offers free private parking. The air-conditioned master bedroom comes with an en suite bathroom. A flat-screen TV with home theater system is available in the living room. There is also a dining area and a well-equipped kitchen for guests’ use. Located in Bandar Sunway, Petaling Jaya, Sunway Housestay is a 15-minute drive to Mid-Valley city and a 45-minute drive from Kuala Lumpur International Airport (KLIA/LCCT). The common kitchen includes a tea/coffee maker, microwave and a refrigerator. Guests can watch satellite channels on a flat-screen TV in the living area. A washing machine, steamboat and barbecue facilities are available at a surcharge. Varieties of Halal food catering and tour arrangements can be made with Sunway Housestay. Located within a 5-minute drive from Tropicana Mall and One Utama Mall, Ryokan Chic Hotel features soundproofed rooms with modern minimalist décor and free Wi-Fi. A 24-hour front desk is available. Hotel Ryokan Chic is a 5-minute drive from The Curve shopping mall and a 15-minute drive from Mid Valley Megamall and KL Sentral. Kuala Lumpur City Centre is a 30-minute drive away. Air-conditioned rooms are fitted with a flat-screen TV and safety deposit box. 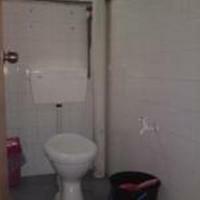 En suite bathrooms include free toiletries and hot water supply. A hairdryer is available upon request. Fax and photocopying services are available for convenience. Common ironing facilities are provided. Hotel staff can provide laundry services upon request. A simple breakfast of bread, coffee/tea and fruits is provided. Best View Hotel Sunway Mentari is located in the heart of Bandar Sunway, a 5-minute walk from Sunway Lagoon Water Park and Sunway Pyramid Shopping Centre. Free Wi-Fi is provided throughout the hotel. Air-conditioned rooms are fitted with a flat-screen satellite TV and en suite bathroom with hot water supply. A hairdryer and ironing facilities are provided upon request. Best View Hotel Sunway Mentari is a 20-minute drive from Subang Parade and a 25-minute ride from KL Sentral. Kuala Lumpur International Airport is a 40-minute drive away. Guests can benefit from a 24-hour front desk. A selection of dining options are available in Sunway Pyramid Mall. Best View Hotel Bandar Sunway is located a 10-minute walk from Sunway Lagoon and offers modern accommodation and free Wi-Fi access in the entire hotel. There are eating options within a 10-minute wakk of the hotel. It takes about 20 minutes by car from Best View Hotel Bandar Sunway to Subang Parade and 25 minutes to Kuala Lumpur Sentral. The Kuala Lumpur International Airport is a 40-minute drive away. The rooms are fully air conditioned and equipped with a flat-screen satellite TV and freshly laundered beddings. Free toiletries are provided for guests’ convenience. A hairdryer and ironing facilities are available on request. Located in Bandar Sunway, Swan Cottage Hotel provides simple, air-conditioned rooms with en suite bathrooms. It is a 10-minute walk from Sunway Lagoon (Theme Park) and offers free Wi-Fi in the entire property. It takes 10 minutes on foot to Sunway Pyramid (shopping) and a 15-minute drive to Subang Parade (shopping). Kuala Lumpur Sentral is a 25-minute drive away, while Kuala Lumpur International Airport is a 45-minute drive from the hotel. The rooms are equipped with a flat-screen satellite TV and an en suite bathroom. Free toiletries are provided. There are also water dispensers on every floor. Ironing facilities are available on request. For meals, enjoy local dishes and fast food a 5-minute walk from Hotel Swan Cottage. My Home Hotel @ Kelana Jaya is within a 20-minute drive of One Utama and The Curve shopping malls, and Kuala Lumpur City. Complimentary Wi-Fi access is provided. Local dining options are available within a 5-minute walk away. The hotel is about a 50-minute drive from Kuala Lumpur International Airport. Fitted with a platform bed, air-conditioned rooms feature hot shower facilities. They offer a flat-screen TV with satellite channels, a wardrobe and tea/coffee making facilities. My Home Hotel has a 24-hour reception. Its staff can assist with luggage storage or fax/photocopying services. This boutique hotel is located within easy walking distance of Paradigm Mall and is a 5-minute drive from Kelana Jaya LRT Station. 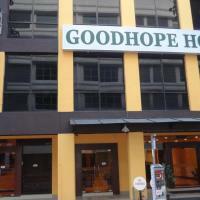 GoodHope Kelana Jaya Hotel provides air-conditioned rooms with en suite bathrooms and free Wi-Fi in the entire hotel. GoodHope Hotel Kelana Jaya is a 10-minute drive from Sunway Lagoon and Sunway Pyramid. It takes 20 minutes by car to I-City Shah Alam and Subang Airport. The Kuala Lumpur International Airport is a 45-minute drive away. 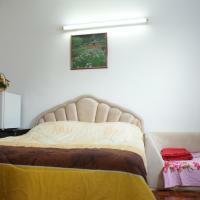 The rooms are modern and well equipped with a fan, a flat-screen satellite TV and ironing facilities. They all have an en suite bathroom offering free toiletries. Some rooms have a mini fridge. There are various food options within a 5-minute walk of the hotel. 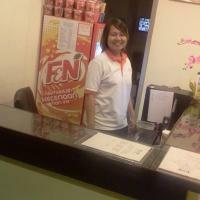 Sun Inns Hotel Kelana Jaya is located on FAS Business Avenue in Petaling Jaya, Kuala Lumpur. Featuring brightly decorated rooms, this 2-star property also provides free Wi-Fi and a 24-hour front desk. It is a convenient 10-minute drive from Kelana Jaya LRT Station and SS2 Town. All guestrooms are fitted with air conditioning, a flat-screen TV and tiled flooring. En suite bathrooms are equipped with a shower. Situated close to Paradigm Mall, Sun Inns Hotel Kelana Jaya is a 15-minute drive from Tesco Hypermarket and The Curve Shopping Mall. Kuala Lumpur International Airport and the Low Cost Carrier Terminal (LCCT) is an hour's drive away. Local dining options are a 5-minute walk from the hotel. Newspapers are provided at the front desk. All rooms are accessible via an elevator and high security electronic key cards. Located just a 10-minute drive from One-Utama Shopping Mall and SS2 Town, Comfort Stay Prima Dataran Condo provides spacious accommodation with 3 bedrooms, a well equipped kitchen and a dining area. Wi-Fi is free in all areas. The rooms at Comfort Stay @ Prima Dataran Condo are fully air conditioned and well equipped with a TV and a writing desk. The apartment has a cosy living area. Located in Kelana Jaya, the apartment is located a 15-minute drive from The Curve Shopping Mall and 30 minutes from Midvalley Shopping Mall. It takes 50 minutes by car from the apartment to Kuala Lumpur International Airport. For meals, guests can sample local dishes in the restaurant located within a 5-minute walk of the apartment. T&Y Hotel is situated a 5-minute drive from Paradigm Mall, as well as local eateries, restaurants and bars. It offers complimentary Wi-Fi access throughout its premises. The hotel is a 10-minute drive from Sunway Pyramid and One Utama Shopping Mall. Kuala Lumpur International Airport is a 45-minute drive away. Air-conditioned rooms feature a flat-screen TV with satellite channels, an electric kettle and a wardrobe. Ironing facilities are also included. The en suite bathroom comes with a hairdryer. Guests can head to T&Y’s 24-hour front desk for assistance with storing their luggage. Free public parking spaces are available at a nearby location. A & F Homestay 2 is a charming home located in Petaling Jaya, just a 5-minute drive from One Utama Shopping Centre. It provides a kitchenette, cosy living areas and plenty of storage space. Wi-Fi is available for free throughout the property. The homestay is located a 20-minute drive from Petronas Twin Tower and 30 minutes from Bukit Bintang. The Kuala Lumpur International Airport is an hour’s drive away, while Uptown commercial area is only a 10-minute walk away from the house. 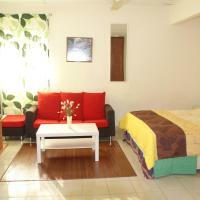 A & F 2 Homestay provides homely accommodation with fully air-conditioned interiors and facilities like a fridge and a TV. Some rooms have a private bathroom and a private dining area. Ironing facilities are provided on request. There is a restaurant which serves local dishes just a 5-minute walk of the homestay. Nestled in a beautiful tropical garden, A & F Homestay Petaling Jaya is a charming home located just a 5-minute drive from One Utama Shopping Centre. It provides a kitchen, cosy living areas and plenty of storage space. Wi-Fi is available for free throughout the property. The homestay is located a 5-minute walk from Taman Bahagia LRT Train Station and a 30-minute drive from Bukit Bintang. The Kuala Lumpur International Airport is an hour’s drive away, while the Night Market (open every Thursday) is located within a 5-minute walk away. A & F Homestay provides 4 bedrooms with fully air-conditioned interiors and facilities like a fridge. Some rooms have a private bathroom and a private dining area. Ironing facilities are provided on request. A washing machine is also available. For meals, there is a restaurant which serves local food within a 10-minute walk of the homestay. 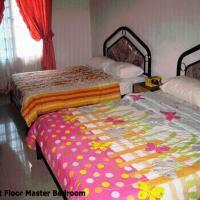 A & F Homestay 1 is a 4-bedroom house in Petaling Jaya, equipped with free Wi-Fi, a kitchenette and a washing machine. Enjoying easy access to LDP Highway, the property is also within a 5-minute walk from several local eateries. Sleeping up to 15 people, this house comes with a separate living room. All bedrooms come with air conditioning and a fridge. Bathrooms are equipped with a shower. A & F Homestay 1 is a 5-minute drive from One Utama Shopping Mall and a 20-minute drive from the famous Petronas Twin Tower. It is a 30-minute drive from Bukit Bintang and an hour's drive from Kuala Lumpur International Airport. O' Boutique Suites features chic and modern rooms with free Wi-Fi in Petaling Jaya. Offering free private parking, the property also has its own restaurant and 24-hour reception. O' Boutique Suites provides easy access to the LDP and SPRINT highways. It is a 10-minute drive to Paradigm Mall and a 15-minute drive to 1 Utama Shopping Centre, Ikea and Ikano Power Centre. Sultan Abdul Aziz Airport (Subang Airport) is a 25-minute drive away while it takes 45-minutes by car to reach Kuala Lumpur International Airport. All rooms are air-conditioned and include a flat-screen TV and warm lighting. The private bathroom comes with a shower, toilet and free toiletries. Dry cleaning and laundry services are provided at an additional charge. Meeting and banquet facilities are also available. Vegetarian meals are served at Organic Recipe Restaurant, which opens from 10:00 - 21:00 daily. De Uptown Hotel PJ is within a 15-minute drive of Mid Valley Megamall and The Gardens Mall. It offers complimentary Wi-Fi access. The hotel is a 5-minute drive from Petaling Jaya’s latest shopping mall – SS2 Mall. A 10-minute drive away is the Sunway Pyramid – a mega shopping centre with shopping options, an ice skating rink, bowling alley and cinemas. Kuala Lumpur International Airport is a 30-minute drive away. Rooms are air-conditioned, and feature a flat-screen TV with satellite channels and an en suite bathroom with shower facilities and toiletries. Linens and blankets are provided. Guests can head to the 24-hour front desk for assistance with luggage storage, or request for a hairdryer or an iron. Free public parking spaces are available at a nearby location. Strategically located beside Sunway Lagoon theme park, City View Hotel is just a minute’s walk to Sunway Pyramid Shopping Mall. It operates a 24-hour front desk and provides free Wi-Fi access in the entire property. Non-smoking rooms at City View Hotel are simply equipped with air conditioning and a flat-screen TV with satellite channels. Rooms come with a private bathroom offering hot shower facility. At City View Hotel, guests can approach the friendly staff to request for hairdryer and ironing facilities. For guests who drive, parking space is available on site at a surcharge. Rooms are accessible with lift. City View Hotel is conveniently a 5-minute drive to Sunway Medical Centre and Monash University. Kuala Lumpur International Airport is approximately an hour’s drive away.